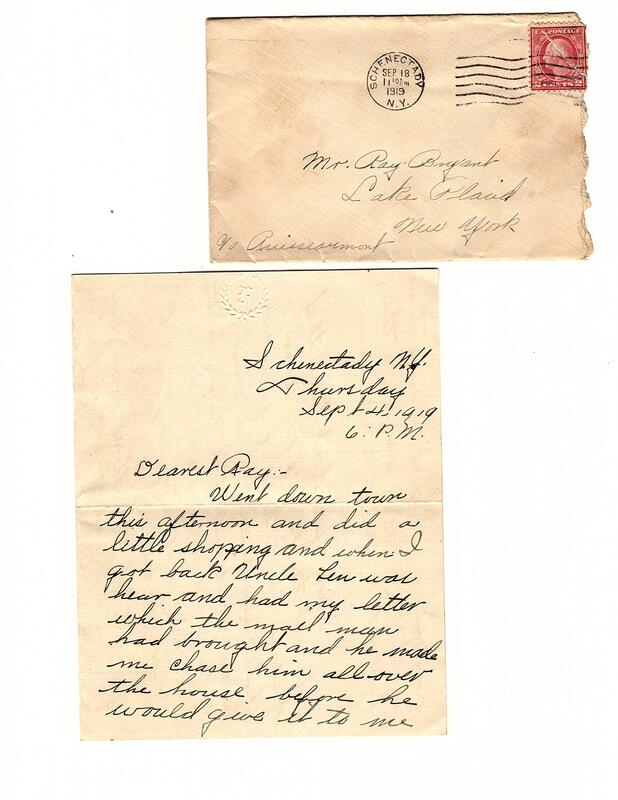 Lake Placid Love Letters c. 1918-1920: The Correspondence of Ray Bryant and Rena Hayes. February is the ‘month of love’ and what better way to celebrate Valentine’s Day than by reading love letters from the early 1900s? In the Historical Society’s collection are over fifty letters between Lake Placid native, Ray Bryant, and his future wife Rena Hayes. Ray was a speed skater competing alongside Charlie Jewtraw and the other stars of the early 20th century. He and Rena were parents to Lorraine Bryant, a figure skater, who entertained guests at the Lake Placid Club; skating exhibitions on the ice sheet that was maintained on top of the Club’s tennis courts during the winter months. Went down town this afternoon and did a little shopping and when I got back Uncle Len was here and had my letter which the mail man had brought and he made me chase him all over the house before he would give it to me and I was just dying to see what was in it as it is the first letter I have received since I have been here. I hope you don’t think that I do not think of you dear because I do think of you all of the time and you must know it because I have written you every day since I have been here and will try my best to do so the rest of my time here. I sent off quite a few postals in the last two days to some of the young people up there but no letters, only to you and my mother + father. Having lovely weather now so I am enjoying myself much better. As soon as you have any idea when you are coming be sure and let me know. Auntie says to tell you to be sure and come, and for you not to disappoint us. P.S. I am not going out anywhere tonight, so you see I’m a good girl.